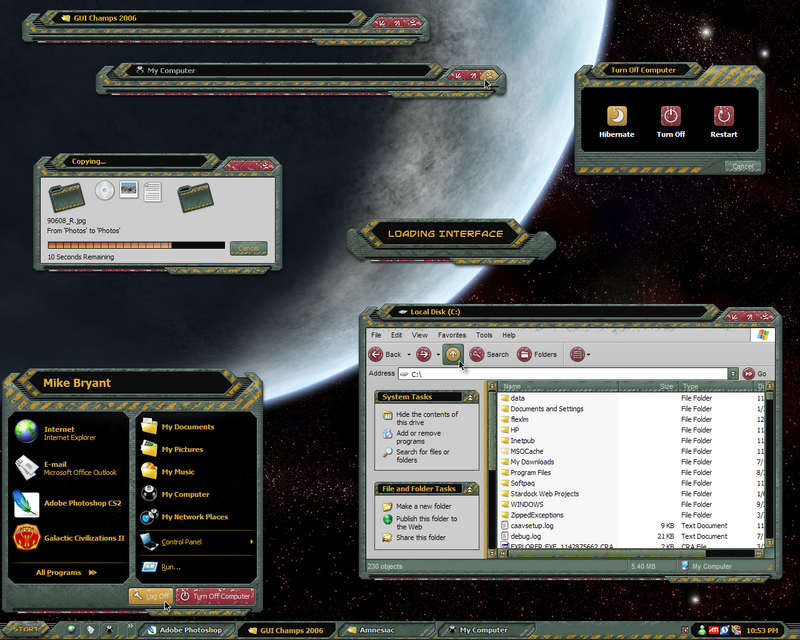 Created for the 2006 GUI Champs, Fett is my second Star Wars inspired skin. This one is loosely based on the weathered, grungy look of Boba Fett's ship and helmet. All of the usual elements are skinned, including toolbar icons, progress animations, and all the per-pixel goodies. I saw this one...missed the other two previously. Stunning dude. Really amazing work. Now I've gotta go. Gotta try out those other skins! Excellence is skin making! T'is a beauty! This was my overall favorite from the GUI's. also my fav GUI skin. I gotta find some Halo wallpapers to go with this. Hell of a Job! this will be my new skin for probably a year, I've been using the same skin for almost a year, the cardinal one, this was good enough for me to change my theme for once in long while! nice job! I don't usually like green skins, especially this shade of green. It remindes me too much of my days in the Army, however it looked really cool in the screenshot and there were so many good reviews that I just had to download it and give it a try. So, now I've been using it for about a week I have to say it is one AWESOME piece of work. I'll be using this skin for some time to come. This really is one skin. I highly recommend it to everyone, Star Wars fan or not. I really hope that you're planning an icon set and boot & logon for this. It would really make it complete, not that it's not fantastic already, but that would just be the crowning glory. At any rate, keep up the awesome work Mike and thank you for this kick a$$ piece of work. Boba Fett is my fav SW character. Awesome skin man, thanks. Where can I find that wallpaper? It looks a little like the Wallpaper (Prime Time by dinyctis) that you displayed with the Parsec WindowBlind. Is the wallpaper displayed with Fett also by dinyctis? I looked for it at deviantART under the science fiction section, but I either missed it (there are so many) or it wasn't there. Awesome! Really hope you will release some Icons, Cursors, Logon and Bootscreen! and.. the wallpaper, i love it but where can i get it?.